Industry Experts has added yet another market report to its High Performance Plastics’ series, Liquid Crystal Polymers. 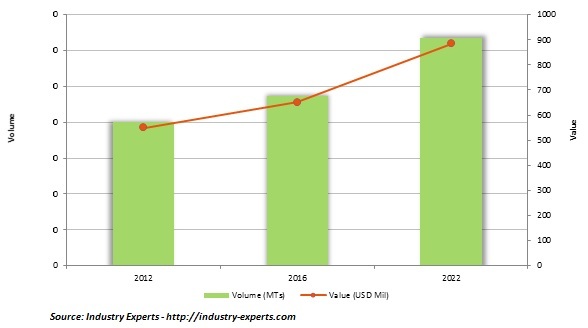 The new report ‘Liquid Crystal Polymers – A Global Market Overview’ reveals that the Electrical & Electronics sector dominated the global market for LCPs, which is estimated at US$525.8 million (84.2% share) in 2015, is forecast to be US$548.5 million in 2016 and is projected to reach US$750.7 million by 2022 to reflect the fastest CAGR of 5.4% between 2016 and 2022, attributed the E&E sector growth in Asian region. Liquid Crystal Polymer (LCP), a high performance engineering plastic, is partially crystalline aromatic polyester based on p-hydroxybenzoic acid (HBA) and other related monomers. The chemical structure and morphology of LCPs is vastly different compared to conventional polyester polymers, due to which there are considerable differences between the two not only in physical and mechanical properties, but also in processability. LCPs have outstanding mechanical properties at high temperatures, excellent chemical resistance, inherent flame retardancy and good weatherability. LCP molecules remain well-ordered even in the melt and slide past each other easily under shear. Due to their excellent flow properties, LCPs can be injection molded into thin-wall components and have outstanding strength at extreme temperatures of up to 300°C. Due to these unique properties, LCP products have proven successful in a variety of applications, including sockets, bobbins, switches, connectors, chip carriers, dental tools, surgical instruments, pumps, meters and valve liners. In particular, the demand for LCPs in the trend of downsizing and thinning of the electrical and electronic components sector has dramatically increased. Electrical & electronic components sector is the largest end-user for LCP, followed by automotive and industrial sectors, among others. LCP demand is further driven by miniaturization of electrical & electronic components in smartphones, laptops and tablets and new emerging applications such as LEDs. However, in the developed regions such as United States and Europe, the fastest growth is expected to come from automotive sector, as vehicle manufacturers are using lightweight materials for automobile components to increase fuel efficiency and reduce carbon emissions. Global Liquid Crystal Polymers (LCPs) market standing at US$650.1 million in 2016 and projected to touch US$883.2 million by 2022 growing by a 2016-2022 CAGR of 5.2%. Asia-Pacific leads the global market for LCPs, forecast to be US$525.7 million (80.9% share) in 2016, which is also likely to record the fastest CAGR of 5.5% over 2016-2022 and reach a projected US$723.2 million by 2022. The Liquid Crystal Polymers (LCP) global market report analyzes the key end-use sectors of LCP comprising Automotive, Electrical & Electronics, Industrial and Others. The global markets for the above mentioned end-use sectors are analyzed in terms of volume in metric tons and value in USD for the period from 2012 to 2022. The study also explores the global market for neat resin LCPs by geographic region and by end-use sector. The report reviews, analyses and projects the Liquid Crystal Polymers (LCP) market for the period 2012-2022 globally and the regional markets including United States, Europe, Asia-Pacific and Rest of World. The regional markets further analyzed for 8 independent countries across North America – United States, Europe – France, Germany, Italy and the United Kingdom; and Asia-Pacific – China, Japan and South Korea. This global LCP market report includes 113 charts (includes a data table and graphical representation for each chart), supported with meaningful and easy to understand graphical presentation, of market numbers. This report profiles 7 key global players and 9 major players across North America – 2; and Asia-Pacific – 7. Additionally, the report also profiles 6 key independent compounders and processors of LCP. The research also provides the listing of the companies engaged in manufacturing and processing of Liquid Crystal Polymers. The global list of companies covers the address, contact numbers and the website addresses of 25 companies.